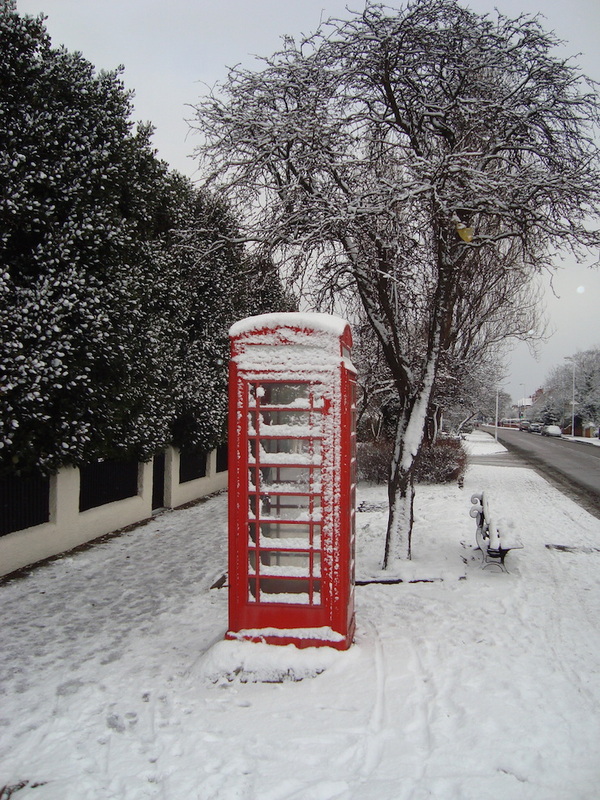 It looks like the old red phone box on the corner of Deneshey Road and Birkenhead Road (pictured above) has made it’s last call. I was walking past today and seeing it happened to jog my memory …there was something on television a couple of weeks ago about a local community campaigning to keep their local public telephones. And that made me try the door to this one. That’s when I realised that the kiosk is locked. So that notice was dated 7th September and 42 days from then is, was, the 19th October. So it would seem that this old phone kiosk will soon disappear? If that notice was on the outside of the kiosk rather than inside it maybe more people would’ve noticed it? I haven’t checked the “OMD” one at Meols – see my old Meols site for information on that one. Does anyone know anything more about this kiosk removal? Is anyone going to miss the phone box (as opposed to the phone inside) if it’s removed? These old red kiosks have a rich heritage and can have another life and perhaps even help save one. Some are used as little community or micro libraries. 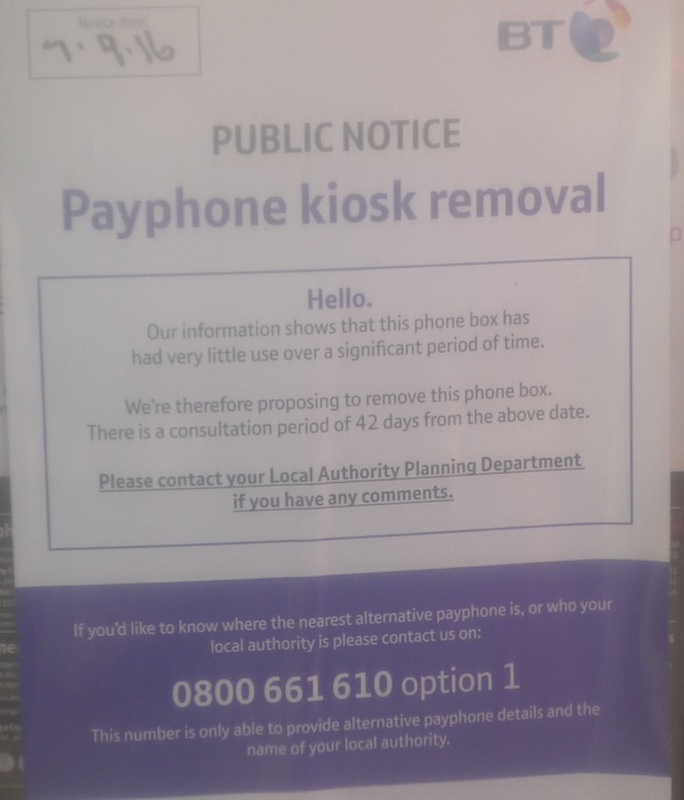 I’ve emailed BT payphones (customer.serv.payphones@bt.com) to request the current status. I’d love to hear your thoughts, please do leave a comment below. I wonder how much it really costs for BT to keep these old landmarks in service? it would seem to me that as a PR measure, maintaining iconic pieces of the urban landscape would be a positive step. Obviously the company doesn’t agree, but it’s sad to see these quaint old pieces of the past disappearing. It would be nice if it could be bought out from BT and turned into a community orientated box. Lending library or an emergency first aid access point. That sort of thing. Some are used to act as housing for Community Defibrillator machines perhaps we it could be used for that..? And maybe a phone line direct to the emergency services as well. 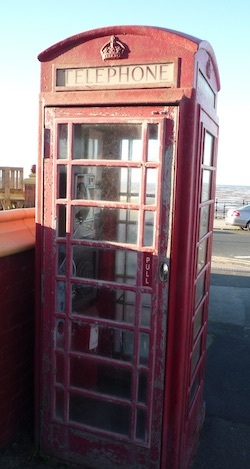 What a shame………there is something about old telephone boxes, isn’t there. In my village here in the Cotswolds our one and only red phone box has been turned into a mini Library! Residents put their used paperbacks inside for everyone to read. Press button B I Say!!! Recently travelling through Derbyshire I noticed that quite a few of the old telephone boxes had been refurbished and included a new occupant – a defibrillator. Maybe this could happen her too. People of a certain age (not sure when that begins) are nostalgic and want icons of the past to be kept and if necessary restored. I am one of those people. I am sure we could find an alternative use for these strange but somehow attractive boxes.. Even if they are only used as a quiet and dry space to use our smart phones! There is one down by the Prom by the boat yard and is like most others, in a deplorable state. But BT would I think, rather they disappeared, as they do not make them any money. However if they could gift them to communities who then can restore them and use them for other purposes, if only as Memorials for a less stressful yester-year, it would as a previous comment suggests, be good PR. Some are being installed with defibrillators, could save lives? Please fight for your red phone box, once it’s gone it’s forever! i wonder if the one at the bottom of Trinity Road has a part to play as an emergency phone, being placed so close to the beach. Not everyone has a mobile phone or carries them all the time, and having access to that phone booth MAY save someone’s life! I’m not sure that BT would feel it was responsible for maintaining such a phone though. It’s a shame to loose the red phone boxes. Aunties ,and uncles in Bebington. All of the above would be great reasons to leave our iconic boxes where they are. I am happy to be part of a maintenance team to preserve these beautiful pieces of street art. Designed by Sir Giles Gilbert Scott , who was also responsible for Liverpool’s Anglican Cathedral, I personally think they should be a listed structure. The OMD telephone box was taken away on August 18th to much outrage.